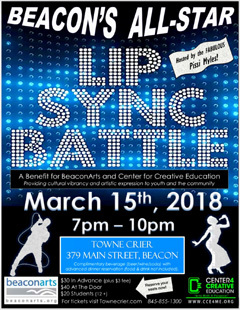 This event, hosted by the fabulous Pissi Myles, is a fun benefit for Beacon Arts and Center for Creative Education, local organizations that provide cultural vibrancy and artistic expression to youth and the community. Complimentary beverage (beer/wine/soda) with advance dinner reservation (food and drink not included). Pissi Myles was born kicking and screaming and hasn’t stopped since. As a comedian, singer and humorist, Pissi has been noted as one of the most talented queens in the Northeast by fans, critics and peers. She received her BFA in Musical Theatre from Montclair State University in 2011, which was promptly traded in for big hair and sequined gowns. Pissi is the title-holder of Miss Fish NYC 2014, a pageant to find the “fishiest” queen in NYC. She is also the winner of Cycle 4 of Mimi Imfurst’s Philly Drag Wars, a 13-week competition in the style of RuPaul’s Drag Race. The mission of the Center for Creative Education (CCE) is to enrich the social and cultural awareness of our youth and community through arts, wellness and education. CCE fulfills this mission by providing innovative, high-quality programs with a special emphasis on serving low-income, minority and at-risk children and youth. CCE provides a wide array of classes in dance, music, fitness, theater, spoken word, computer arts technology and the visual arts. BeaconArts is the artery through which much of the city’s creative efforts flow and manifest, with expenses offset mostly by business owners and arts-minded individuals who recognize the economic value in supporting local arts and culture. BeaconArts' mission is to develop and facilitate inspiring experiences and programs that promote a vibrant community and enrich the lives of our local citizens, as well as to enable resident artists to live and work in Beacon by widely promoting their projects. In addition to catalyzing our community around large scale public events like Second Saturday, the Bicycle Christmas Tree and Bicycle Menorah, Windows on Main Street and the Bus Shelter Project, BeaconArts is fiscal sponsor for independent grassroots projects including Beacon Open Studios, the Beacon Independent Film Festival, Beacon 3D, Keys to the City, the Beacon Arts and Education Foundation with more continuously coming under its umbrella. Visit BeaconArts.org for more information.